This entry was posted in Important Society Issues on October 2, 2016 by Steve Tilford. I hang out in Cable Wisconsin a ton. This area is the epicenter of cross country skiing in the US. It is the home of the American Birkebeiner, the largest cross country ski race in the US. It is also the local where the CXC Ski team does a ton of its training. The CXC Ski team is a midwest based cross-country ski team that does so much for nordic skiing, they should probably be the de facto governing body of the sport. They cover all aspects of nordic skiing from grass-roots, to masters, along with an Elite ski team. So many of the US Olympic Nordic skiers have come up through the CXC program. Anyway, CXC, and my sponsor, Kent Eriksen are raffling a complete bike to raise money for CXC’s adaptive ski program. CXC puts a ton of energy and time into this. They promoted The International Paralymic Nordic World Championships, in Cable, twice now, and dedicate a ton of resources to this program. Anyway, check out this link to the site where the raffle is. The raffle ends today, Monday, October 3rd. The 1st place winner will receive a custom designed, hand crafted, Eriksen titanium road frame built with Shimano Ultegra wheel-set (or similar equivalent) and Shimano Ultegra speed component group (or similar equivalent). 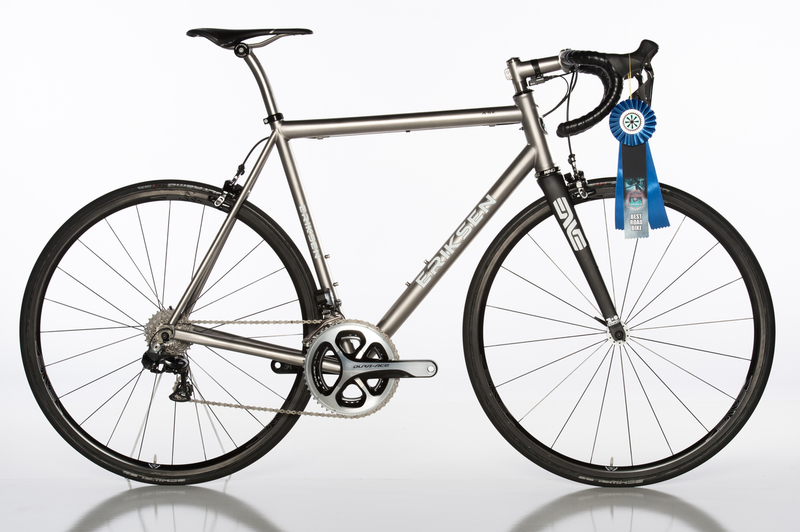 Pretty good way to maybe get the best titanium bicycle frame in the World, plus it is for a really good cause. Can we choose a carbon version, or just the old skool ti version? now that’s a sweet ride!!! What a great organization and project! And a raffle with a bike, and what a bike! Thanks for letting us know, Steve! I have a ticket! Let’s cheer for my rubber duckie!